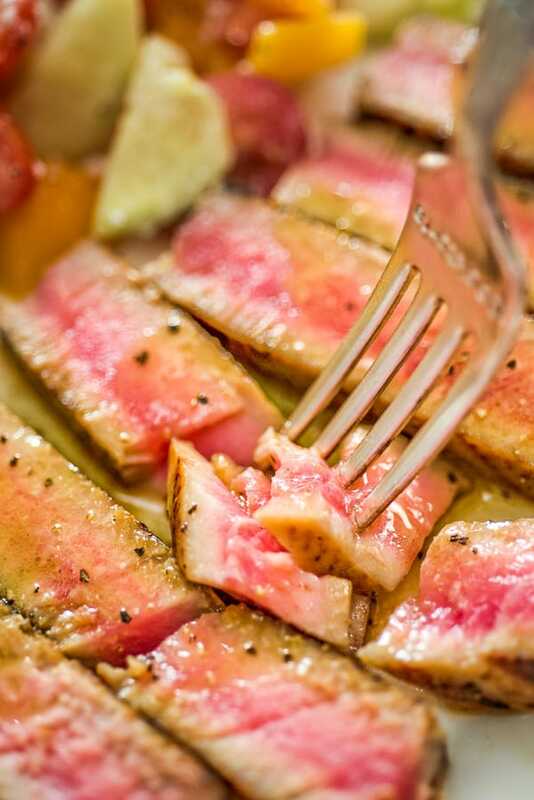 Ahi Tuna Steak – an easy, yet elegant, dinner worthy of the most special occasion! 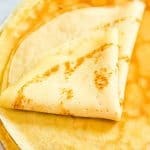 Made with Maple-Mustard Sauce. How about some Ahi Tuna Steak for dinner, friends? 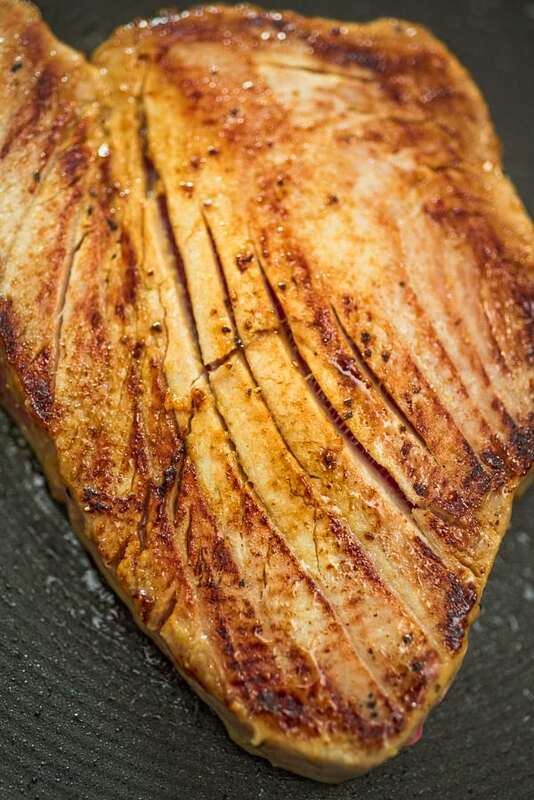 My super-easy, foolproof, pan-seared tuna steak recipe is going to make your meal special. 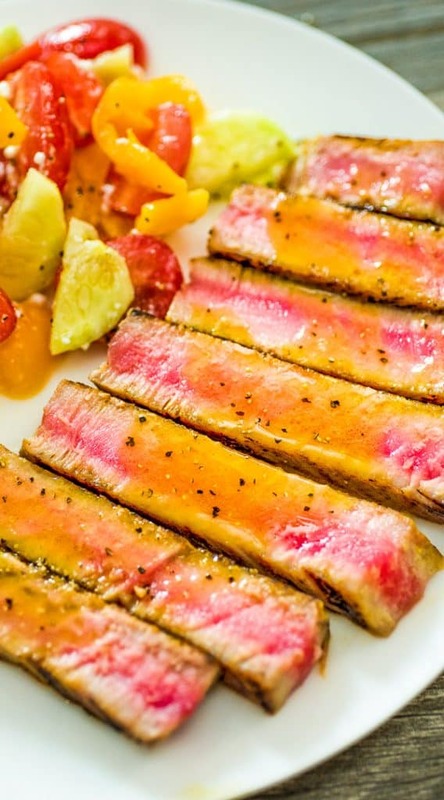 While the steaks are marinating in the sauce, you’ll have time to whip up a quick salad, or steam some vegetables. I don’t cook tuna very often, but when I do, I savor every single bite. I’ve tried many spice mixes and marinades for tuna steak, and the Maple-Mustard Marinade I am sharing today is by far my favorite. 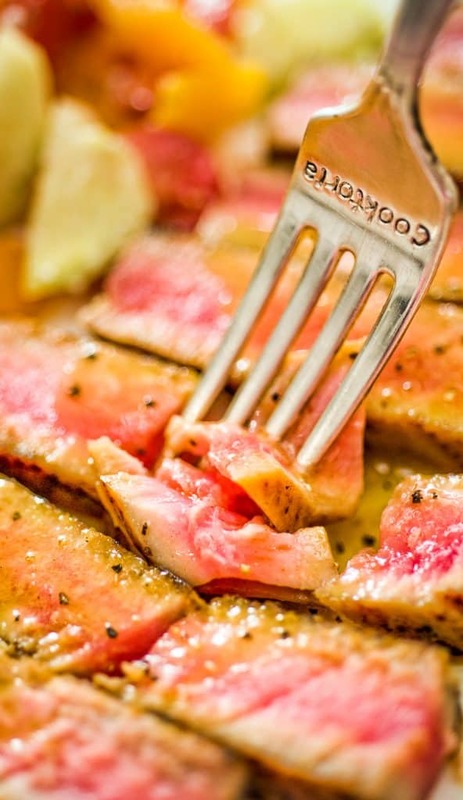 Have you had Ahi Tuna Steaks before? 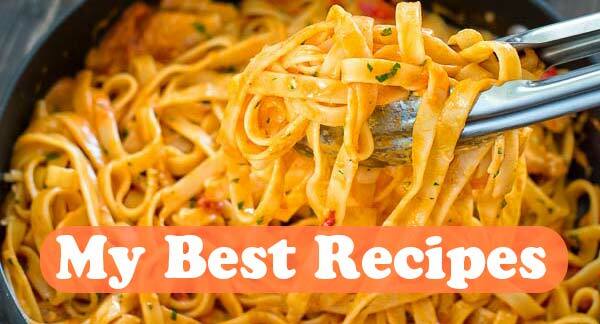 If not, I hope you’ll start your Tuna Steak adventures with this recipe. There are four widely consumed varieties of tuna: Albacore, Bluefin, Skipjack, and Yellowfin tuna. Yellowfin tuna (a.k.a. Ahi Tuna) is a species of tuna found in the pelagic waters of tropical and subtropical oceans worldwide. The fish have pink flesh with a mild flavor. 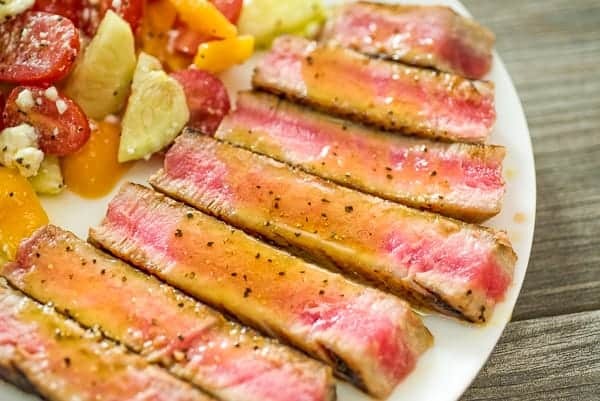 Where to Buy Ahi Tuna Steak? Depending on where you live, you might have difficulties finding some good Ahi Tuna steaks. Because it’s best to keep the middle of the steaks raw, you’ll need some fresh sushi-grade tuna. The best place to buy it is at a popular local fish market. 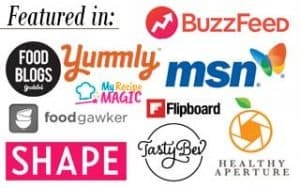 Just do a quick Google search and find a fish market in your area that has good reviews. If there are no good fish markets in your area, you may opt for frozen Ahi Tuna. To be honest, the difference between fresh and frozen tuna is noticeable, so I always prefer the fresh ones. Buy the fish. Get your hands on some fresh, sushi-grade Ahi Tuna filets. Marinate the fish. Take your fish out of the refrigerator. 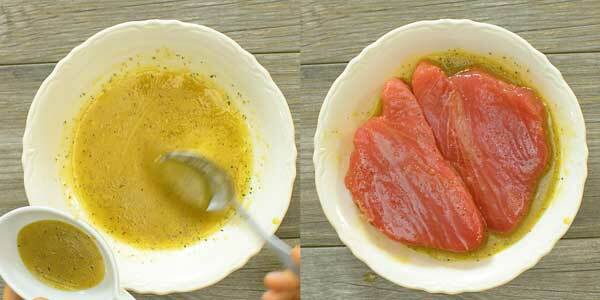 Prepare the marinade and cover the fish with it. Set it aside and let it marinate for about 20-25 minutes. This will allow the fish to come closer to room temperature and absorb some of the marinade flavors. Sear the fish. 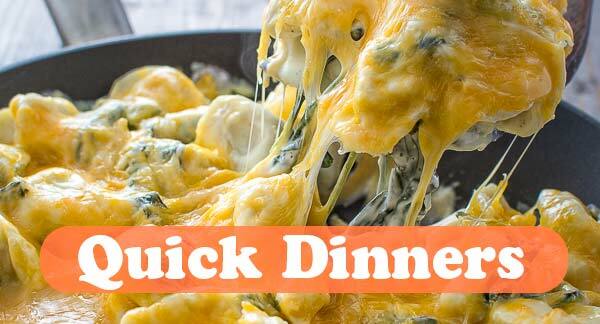 Heat up a non-stick (preferred) or cast iron skillet over very high heat. Place the steak(s) and sear for about 1-3 minutes on each side, or until the steak reaches the desired doneness. When searing Ahi Tuna steaks, it is important not to overcook them — the fish tastes best when rare in the center (but of course, cook to your liking). Serve the fish.Cut the Ahi Tuna steaks against the grain into ½-inch thick slices. Drizzle with the reserved marinade. I use this marinade to drizzle on top of the steak, once it’s cooked, too. Very tasty! 1. Take the Ahi Tuna out of the refrigerator. Remove the packaging, and set aside. 2. In a large dish, mix all of the marinade ingredients together. Reserve about four tablespoons of the marinade. Add the tuna steaks to the dish, and turn them until they’re well-coated. Set aside, and let them rest at room temperature for about 20-30 minutes. 4. Place the cooked steaks on a cutting board, and slice against the grain into ½-inch thick slices. 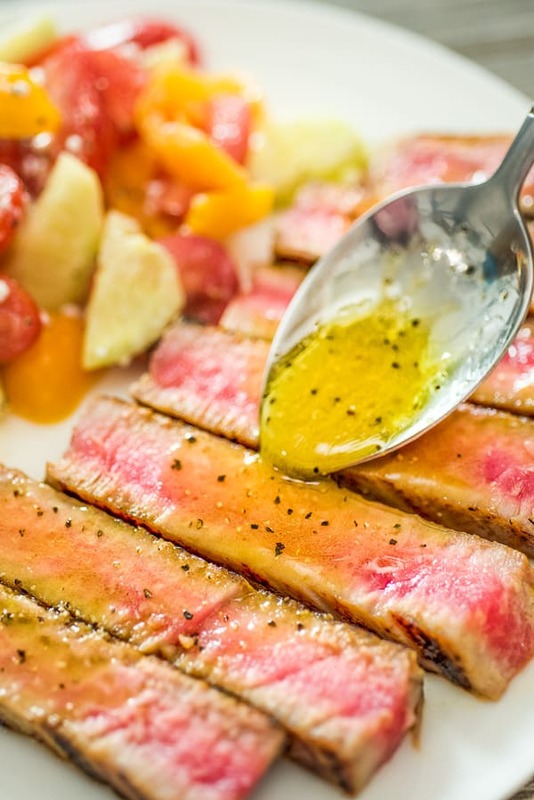 Transfer the steak slices to a serving plate and drizzle with the reserved maple-mustard marinade. Serve immediately. *It is best to leave the middle of the tuna steak raw. 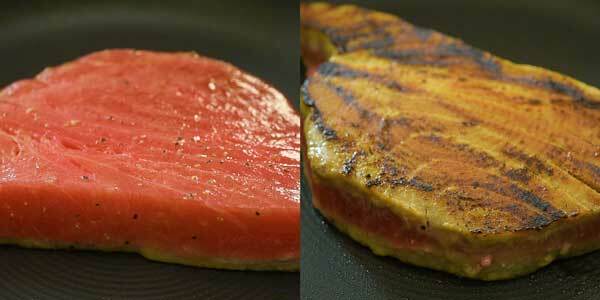 Searing time will depend on your personal preference and on how thick your tuna steaks are. I like to stay and watch the steaks closely while searing. It is easy to see how the steak changes color as it cooks, so when it looks like it’s 25% cooked on the bottom, I flip it and cook it for the same amount of time on the other side. 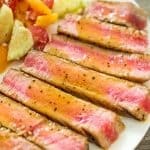 Is Ahi Tuna Steak Healthy? 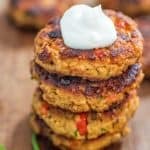 Because of the high levels of omega-3 fatty acids, consuming tuna fish helps reduce omega-6 fatty acids and LDL, or bad cholesterol, in the arteries and blood vessels. Tuna fish is packed with protein. 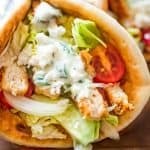 Proteins are the building blocks of our body, which guarantee growth, faster recovery from illnesses, improved muscle tone, and overall metabolic efficiency. Is Ahi Tuna High in Mercury? Being on the top of the food chain, tuna fish does have higher mercury levels when compared to other fish. 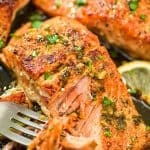 However, according to the FDA, most people are not affected by the low levels of mercury in most seafood, but sensitive populations like pregnant women and children should limit eating tuna to one serving, or six ounces, per week. 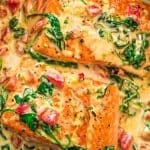 What to Serve Ahi Tuna Steaks with? 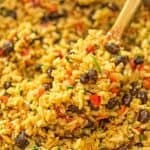 Cooked rice, quinoa, or couscous. Steamed or fried vegetables, such as broccoli, asparagus, carrots, andcauliflower. Fresh salad. I especially love this Tomato Salad and Tomato Avocado Salad. Take the Ahi Tuna out of the refrigerator. Remove the packaging, and set aside. In a large dish, mix all of the marinade ingredients together. Reserve about four tablespoons of the marinade. Add the tuna steaks to the dish, and turn them until they’re well-coated. Set aside, and let them rest at room temperature for about 20-30 minutes. Place the cooked steaks on a cutting board, and slice against the grain into ½-inch thick slices. 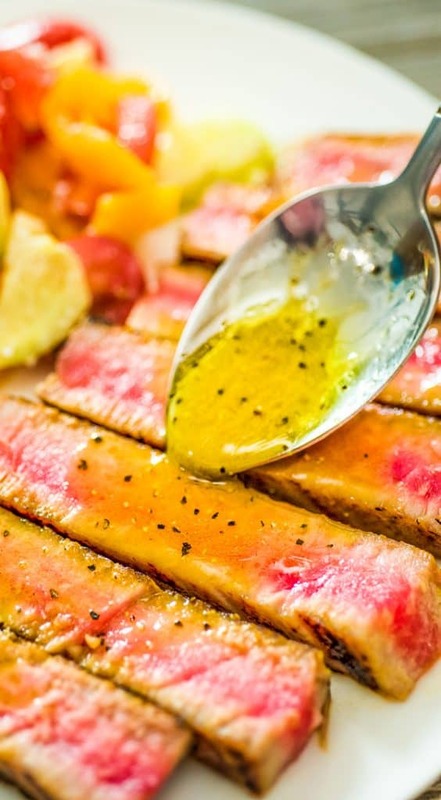 Transfer the steak slices to a serving plate and drizzle with the reserved maple-mustard marinade. Serve immediately. The tuna is perfectly seared. Love that marinade! This is honestly the most devious tuna steak recipe I’ve tried. thanks!